Touring through Spain and Portugal is a memorable experience in itself, but even more so when you stay in one of their unique Paradors or Pousadas. These hotels are in spectacular Castles, Palaces, Monasteries and Convents, converted by the State into luxury hotels, as a means to financially support their restoration and guarantee their protection. Located in areas of outstanding beauty, they have a fascinating history, feature incredible architecture, exquisite cuisine, and luxurious rooms with a delightful ambience and superb service. There are 94 Paradors in Spain, many located in World Heritage Cities like Toledo, Segovia, Santiago de Compostela and Granada. Others are located in important nature reserves, or on beautiful waterfront settings. The most distinguished and popular is Parador Granada located in the Alhambra palace in Granada, where reservations usually have to be made months in advance. 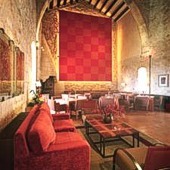 This 15th century convent has an elegant decor of antique furnishings, portraits, lithographs, and embroidered textiles. 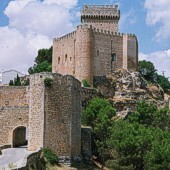 Another choice might be the 10th century Muslim fortress, now the Parador de Jaen, north of Malaga, which sits on top of an escarpment and has spectacular views of the Andalusia countryside below. A few hours southeast of Bilbao is the Parador de Zamora, formerly a Moorish fortress and Renaissance castle. It is the most opulently adorned of all the Spanish Paradors, with medieval detail that includes lavish tapestries, coats of arms, historic armour, and beautiful canopy beds. Should your travels take you to Portugal, there are the equally charming Pousadas located in interesting and beautiful locations. The concept of Pousadas was created in the early 1940s by Government Minister António Ferro, also a poet and playwright, who wanted the hotels to retain the characteristics of the Portuguese culture. The Pousadas of Portugal are divided into four categories: historic, historic design, nature and charm. Like stepping back in time, they are renowned for their style and welcoming atmosphere. There are now 42 all across the country, the most recent acquisition to the hotel group being the popular destination of Porto (Oporto). The Palacio do Freixo was built in the 18th Century, and has recently been converted into a Pousada, with its own health club and spa, with indoor and outdoor swimming pools. On the Southern coast is the Tavira Pousada, the former 16th Century Convento da Graca. The rooms are extremely comfortable and elegant, with small balconies and terraces. Some even have a private garden. Many of the Paradors and Pousadas have facilities for disabled guests, and all the Paradors have a gluten free menu in the restaurant. Golden age: offering a discount of up to 50% off to one or more guests over the age of 55. 5 Night Card: which is often the best option if visiting several Paradores (up to a maximum of five), as you get a special low rate for advanced reservations, and 20% off meals. 2 Night Special: when you stay two or more consecutive nights at the same Parador you can get a 20% discount on the official rate for a standard double room with half board. Young Persons Getaway: is for those between 20 and 35 years of age (inclusive) offering a standard double room with breakfast included, at a very reduced rate. Honeymoon offer: a reduced rate for two nights minimum, including half board, VIP treatment, and an upgrade on the room. Sounds simple but it can become very complex, and only book direct through a booking engine if you are a mathematical genius with a lot of spare time! Thankfully, there is also a free service with experienced staff at the two domains listed above to help you find the best deals. By sending them an email of your requirements, they will be able to wade through these complex calculations for you, and will be able to make a provisional reservation at the discounted prices. All provisional bookings can only be held for a few days before confirmation is required, giving you time to work out your travel arrangements. The reservation will be confirmed in your name direct with the Parador or Pousada, and secured by your credit card details. You will be given a direct telephone number to call if there are any travel delays that require a late check-in or cancellation. No money will be taken from your card for this service and full payment for your bill will be required when checking out. The card will however be used for any cancellation charges - another good reason for taking out travel insurance! Be sure to browse through the extensive listings of the Paradors and Pousadas, which offer photos, descriptions, prices and guests comments. These unique hotels guarantee to make your travels through Spain and Portugal complete at an affordable price.